There is some controversy as to the origin of Thanksgiving in the new world. In 1565, explorer Pedro Menéndez de Avilé invited local native Indians to a to dinner in St. Augustine, Fl. after holding a mass to thank God for his crew's safe arrival. 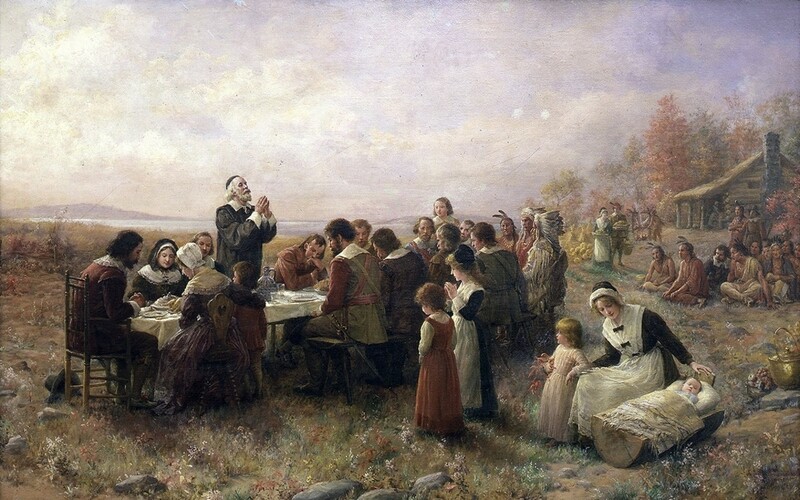 In 1619 when British settlers reach the banks of the James River in Virginia a proclamation was read commemorating the day as “a day of thanksgiving to Almighty God." Neither of these dates went any further, however - they were a one time affair. It is generally accepted that the Pilgrims in Plymouth, Mass. 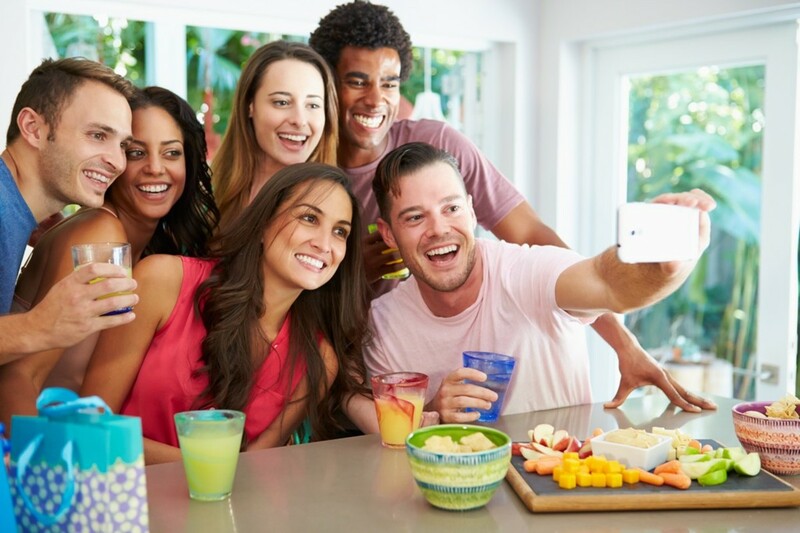 held the first celebration of what was to become Thanksgiving in the U.S. Interestingly, Thanksgiving began as a very religious ceremony with the Pilgrims but, much like Halloween or even the celebration of Christmas, the religious aspects have faded somewhat. Thanksgiving is perhaps more closely related to Easter in this respect; while it remains a day of prayer, thanking God, the secular aspects have grown to many people. The painting above is entitled "The First Thanksgiving" and was done by Jean Leon Gerome Ferris circa 1912-1915. While it certainly gives the feeling of that first Thanksgiving, it is not historically accurate. The pilgrims clothing is incorrect, the Wampanoag did not wear feathered war bonnets (certainly not at a friendly feast) and would not have been sitting on the ground. In addition, it appears that bread is being served, but all flour was long gone by that time and there would have been no bread available. In September of 1620 a small (very small by modern standards) ship named the Mayflower left Plymouth, England bound for the new world. Aboard were 102 passengers; some looking to make a new life for themselves where they could practice their religion in peace and some looking for prosperity and riches. It was a treacherous crossing with violent storms that kept them from their intended destination of on the Hudson River. Come December, after 66 days at sea, the ship finally made landfall far from where it should be, and dropped anchor off the tip of Cape Cod. A month later, the Mayflower crossed the bay, where the pilgrims (as they are now known) began the work of building the the colony of Plymouth. The first winter was a terrible ordeal. Forty six of the settlers never saw the next spring, succumbing to the weather and lack of food. Finally leaving the ship in March, the pilgrims moved ashore where they met Squanto, a member of the Pawtuxet tribe. Squanto worked with the pilgrims through spring and summer, teaching the malnourished pilgrims to grow local foods, hunt and fish and was instrumental in the colony's survival. Squanto also introduced the pilgrims to the Wampanoag, a local tribe, and helped forge an alliance that would last for 50 years. In November of 1621 after a successful harvest, Gov. William Brandford arranged for a feast and invited the Wampanoag to attend, which they did in force; some 90 Indians attended the three day festival. 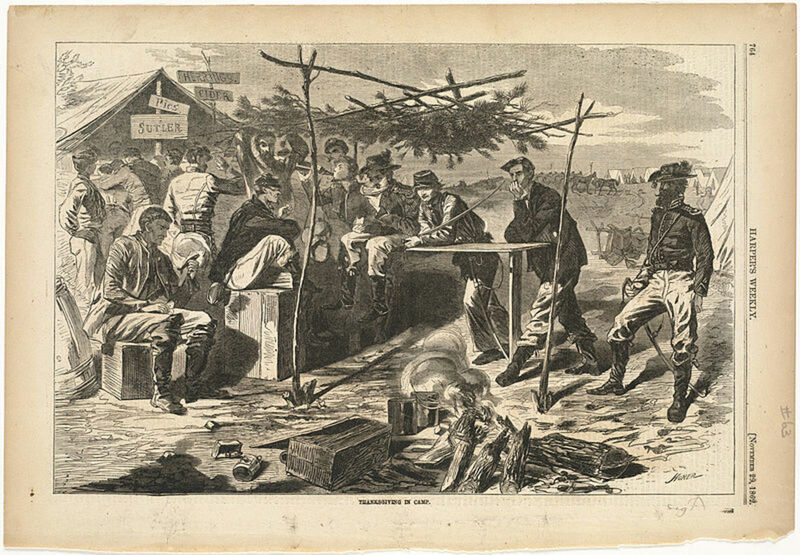 There is no record of the exact menu for the celebration, although we know that the Governor sent 5 men out fowling for wild birds and that the Indians brought 5 deer to the feast. While it is certainly possible that turkey and pumpkin were on the menu we cannot know that for sure. 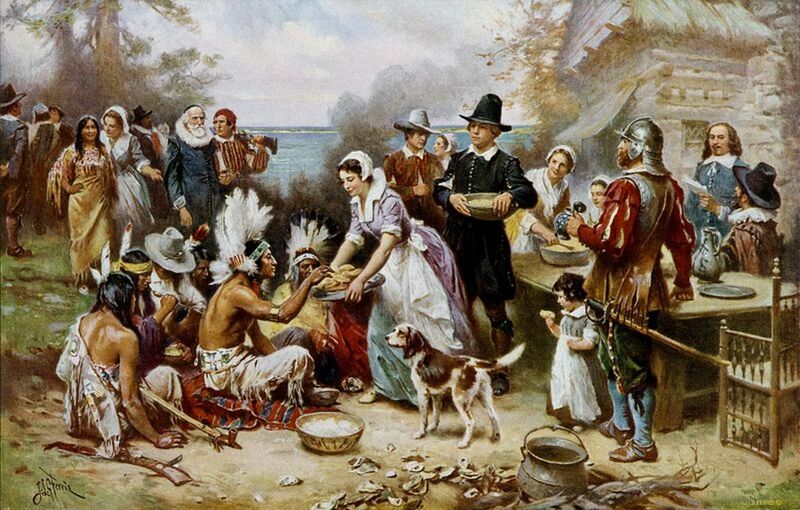 There was no "Thanksgiving feast" in 1622, a year after the first one, but in 1623 the Plymouth colony did repeat the feast and days or periods of thanksgiving feasting spread through other colonies over the next few decades. It was never a formal, united, celebration but varied by location. A few celebrated nearly every year, some only occasionally, but it was spreading. In 1789 George Washington issued the first Thanksgiving proclamation by the US government, calling for Americans to express their gratitude for the successful completion of the war of independence and the ratification of the constitution. In 1817 New York became the first state to declare a yearly celebration and it was followed by several more. Not all - most of the south was still unfamiliar with the custom. Momentum was building, though, and it was only a matter of time. 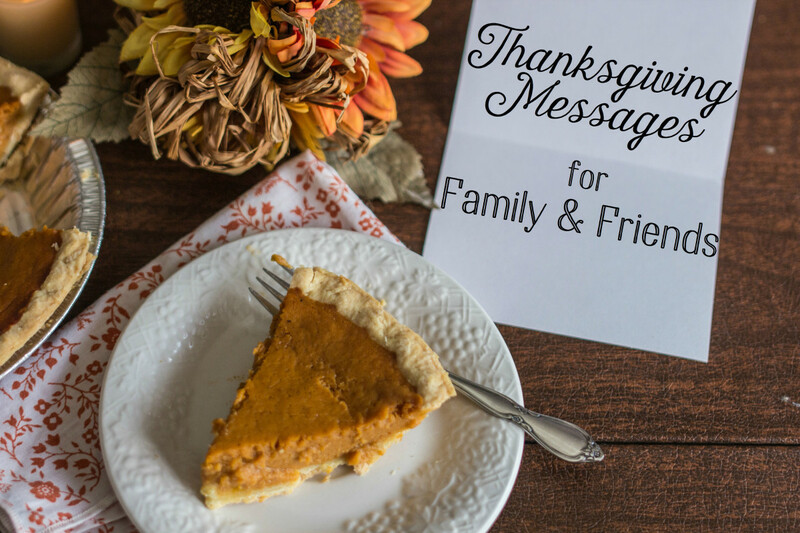 In 1827 a magazine editor and writer, Sarah Josepha Hale, began a 36 year campaign to have the entire US formally recognize Thanksgiving. Her wish was finally granted in 1863 during the height of the civil war by Abraham Lincoln, who designated the last Friday of November as Thanksgiving. In the proclamation Lincoln asked all Americans to ask God to “commend to his tender care all those who have become widows, orphans, mourners or sufferers in the lamentable civil strife” and to “heal the wounds of the nation.” It was not yet a national holiday, and every president had to renew it each year, but Thanksgiving was celebrated every year on the last Friday of November for many years after Lincoln's proclamation. Sarah Josepha Hale, the one person perhaps most responsible for Thanksgiving, also wrote "Mary had a little lamb"? Sarah was a prolific author and that popular children's poem was just one of her many works. Until, that is, 1939. 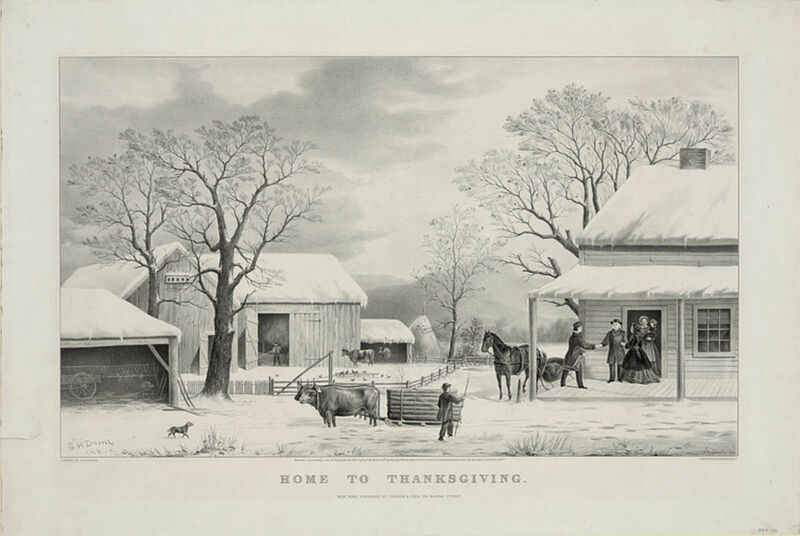 That year Thanksgiving fell late in the month, on Nov. 30, and merchants wanted more time for Christmas shopping. Franklin D. Roosevelt accommodated them by moving Thanksgiving up one week for that year only, to Nov. 23, but it was not well received. 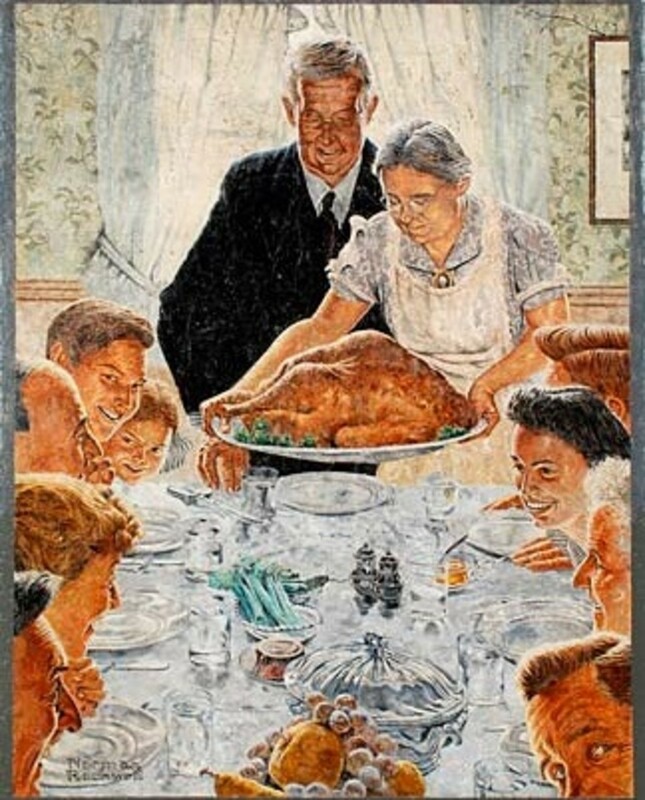 In 1941 congress passed a bill making Thanksgiving a permanent national holiday on the fourth Thursday of each November, which Roosevelt signed into law. Commercialism was (and is) so important that Thanksgiving has since spawned another, unofficial, holiday - Black Friday, with it's own history and legends. 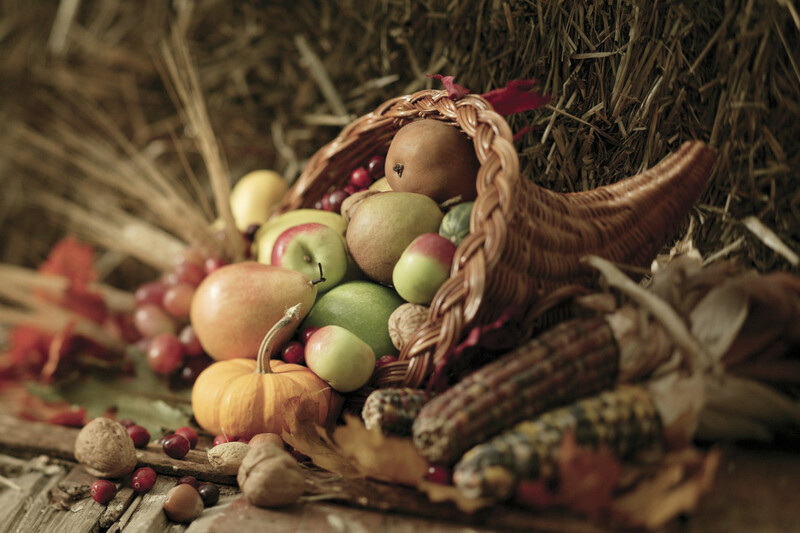 Thanksgiving has remained on the fourth Thursday of November since that time; seemingly a good compromise to all. 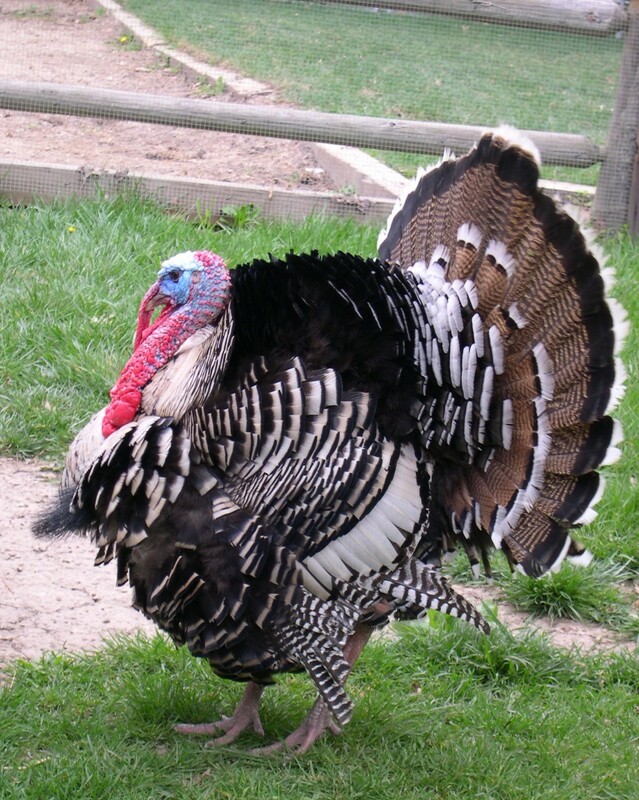 The menu will certainly vary region to region and house to house (rotten egg pie is a necessity for one large family) but turkey is almost always required as part of that great feast. When FDR moved Thanksgiving in 1939 it was not well thought out. The action was taken in October of that year, leaving many people high and dry with their plans and his tardiness in making the change was a good part of the reason it was disliked so much. So much, in fact, that a great many areas actually had two Thanksgiving celebrations that year (can you imagine the weight gain, countrywide?) with the first being called "Franksgiving". Do you or your family have special traditions all your own for Thanksgiving? Yes, we have a special menu. No "rotten egg pie", though! Wonderful hub here, and congratulations on HOTD! I loved reading on all of the history here and had read most of this and knew it, but it is nice to see someone here on HubPages to write about it after thoroughly researching it. Nice retelling the story of this pleasant and enjoyable time. This is going to be more special this time. Congrats on HOTD. I was sure Thanksgiving is a Christian holiday and it seems you have confirmed it. Naturally there are always those who believe in nothing yet want to steal others holidays and change them around; lol. Like not allowing us to say Merry Christmas but Happy Christmas; how silly is that? Do they think merry is a Christian word? Maybe it is just about control like the spoiled kids we avoided in elementary school? Their way or no way. Well...hope you had a great Thanksgiving! 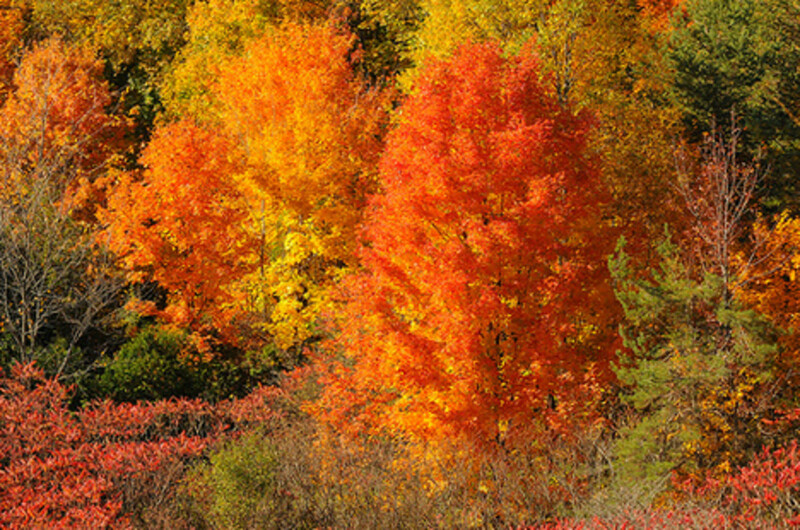 In England we do not have Thanksgiving but there is a fall harvest festival, which is in late October. I find that the American holiday is too close to Christmas and there is no time to recover before we start feasting all over again for Christmas! Loved the Hub! Hi, I enjoyed your Hub about one of my favorite holidays. This was a nice piece of American History and I even learned a little something. Thanks Happy Thanksgiving. Enjoyed reading this. Happy Thanksgiving to you. Excellent article and history lesson. I enjoyed every bit of it. You had quite a bit of content here that I didn't know about. Thanksgiving means quite a bit to our family. I grew up traveling on the holidays and I am prior service and missed a few holidays at home while I was in the service. The simple joy of our family being together, everybody healthy and happy, is something I don't and won't take for granted. You created an excellent hub with this information. Enjoy your Thanksgiving Day with your family, sir. Wow, I had no idea that it involved Abraham Lincoln and was changed by Roosevelt. Quite an interesting story. Happy Thanksgiving to you. Congrats on HOTD! I learned a lot from your Hub, which was well researched. I have often wished Thanksgiving could be celebrated in the Spring rather than so close to Christmas. Voted this UP, etc. and will share here and on FB. I hope your Thanksgiving will be a good day for you and yours. Really enjoyed this well written history. I appreciated thanksgiving more after reading this. While we have read about different versions of the true history of Thanksgiving Day that millions of Americans celebrate, you have given one that is very interesting, comprehensive, and well researched, leading to the present time. Congrats on Hub of the Day! As with so many of our festivals it would not be surprising that two or more were "combined" into one, or that one morphed into something totally different. While it is pretty well accepted that Thanksgiving began with that meal between Pilgrims and Indians, it is quite likely that Sukkot and Thanksgiving merged into one as time went on. Enjoyed learning about the origins of Thanksgiving. We love getting the family together each year for turkey and dressing, and have begun making Black Friday a part of our tradition. Although I spent a few Thanksgiving Days in the US, we never celebrated it - not sure we really knew what it was about! Thanks for explaining it - if I'm ever over there again, I'll feel far more knowledgeable. You're more than welcome, GoodLady. Researching this hub was very interesting and although I was familiar with the basics, I learned considerable. Thank you so much for such a nicely told history lesson! I enjoyed it a lot and had no idea all those things happened. Love your picture at the top. It's great!